Central to President Ramaphosa’s plans for revitalising South Africa is ‘a massive increase in investment in the productive sectors of the economy.’ What does this mean for land reform and the prospects for growth, development and job creation in the agricultural sector? The bottom line is that new farmers on redistributed land will not be successful and new jobs will not be created unless the productivity of land is improved. Productivity will not improve unless investment in agriculture is increased. Government cannot generate such investments, so growth and jobs in agriculture can only be produced by the private sector. Encouraging this kind of investment requires a new and different approach to land reform. How can the environment be made more supportive? The first principle should be to refrain from changing the Constitution. No constitution is inviolable and there can be occasions when a constitution should or must be changed. However, some parts of a constitution are more sensitive than others; given the enormous economic challenges we face and the collapse of economic growth over the last decade, property rights is an area of particular sensitivity. Blaming the Constitution for the failure of land reform is a classic piece of political misdirection; acting on it will at best raise uncertainty and reduce investment and at worst provoke a banking crisis that will destroy institutions such as the Land Bank, spill over into the rest of the economy and make everybody, particularly the poor, worse off. A second priority is to clear the decks. The 2017 High-level Panel Report to parliament chaired by former president Kgalema Motlanthe estimates that there are more than 7,000 unsettled pre-1999 claims and another more than 19,000 unfinalised. Since then thousands of additional claims have been lodged, all of which remain unresolved. The process has decayed as a result of poor design, exacerbated by corruption, poor institutional capacity, legal and policy confusion, leading to endless delays. The political urgency of land reform is clear to all, but embarking on accelerated and extended state-led land redistribution before strengthening a shockingly weak institutional infrastructure would be a dangerous gamble. A further key to encouraging a supportive environment for investment and hence for successful land reform, is to harness the private sector’s wealth of experience and expertise, not only in core areas such as agri-business and processing, but also in land reform partnerships. Over the past ten to fifteen years, many individuals, organisations and supporting institutions in commercial agriculture have worked hard to make such partnership projects viable. If properly supported by government policy, attitudes and institutions, such partnerships could spread and multiply, to the benefit of new black farmers. If these principles and priorities guide the process, there will be a much better chance of making land reform workable. However, if the economic benefits are to be shared more widely than within a necessarily restricted class of new commercial farmers, then additional goals need to be targeted. Addressing poverty, inequality and economic inclusion requires, above all, employment growth. On most commercial farms, especially those producing grain, increasing mechanisation, driven by competitive pressures and rising wage costs, has meant fewer jobs per hectare, even when investment leads to growth and expansion. Other sectors are not so susceptible to mechanisation and are more labour intensive. These include field crops (sugar cane and cotton) and horticulture, such as avocados and macadamia nuts, for which there is fast growing global demand. Mpumalanga and Limpopo provinces, where investments in labour intensive exportable crops could create many thousands of jobs, are among the worst hit by uncertainties over unresolved land claims, which stifle investment and job creation. Perhaps the most important principle of all is to see transformation in land and agriculture in the perspective of the larger economy. 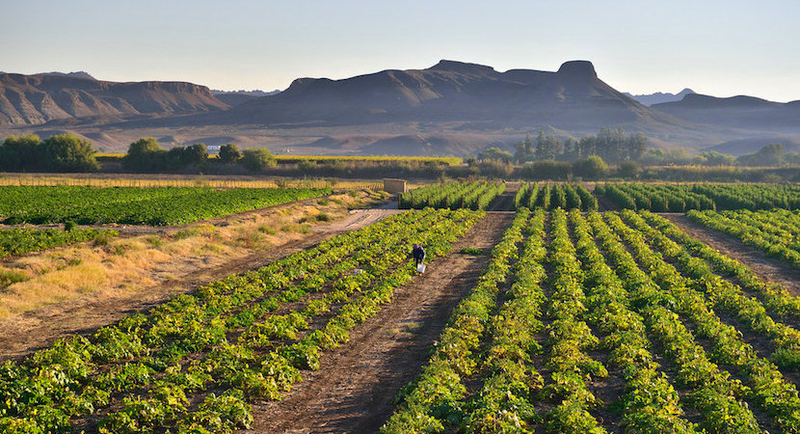 A pervasive and understandable sense of historical injustice encourages some to see land as a standalone issue, which is the source of all South Africa’s ills, and to see transformation of farm ownership as the means of healing them all at once. This is to mistake a part for the whole. We have to acknowledge not only that ill-judged land reform has the potential to destabilise the entire economy, but also bear in mind the limits of land reform in the larger economic context. The backdrop to the land reform issue is that South Africa is a country with 50% of its population who are poor, vast inequalities, and the world’s deepest unemployment crisis. These facts are features of a country that is nearly 70% urbanised. Any workable scheme of land reform has to acknowledge that it would be futile to try and reverse the dynamics that have led to these levels of urbanisation in South Africa. Indeed, urbanisation is desirable and can help drive economic growth. Those who are committed to farming and are capable of coping with the increasingly adverse conditions South African farmers face should be given the opportunity and appropriate level of support to do so. But the best places to create opportunities for millions of poor and unemployed people – mostly young, many poorly educated – will be in dynamic, well-managed cities in which employment and enterprise can grow. Urban land reform is a key part of urban management and there is much to be done here. Government needs to pay more attention and devote more resources to the needs of our expanding cities, especially on devising policies to provide affordable housing and access to work in ways that break the stranglehold of the apartheid city’s legacy. Successful land reform means a rapid and steady expansion of black participation as owners, and also as managers and workers in the agricultural sector. This would be enormously beneficial for the country, but on its own it will not resolve most of our social and economic challenges. It is vital that we ensure that efforts to deliver land reform don’t make it harder to accelerate national economic growth, inclusion and employment. 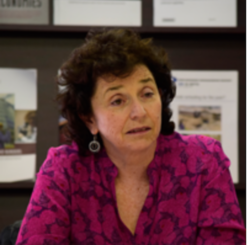 Ann Bernstein is head of the Centre for Development and Enterprise. 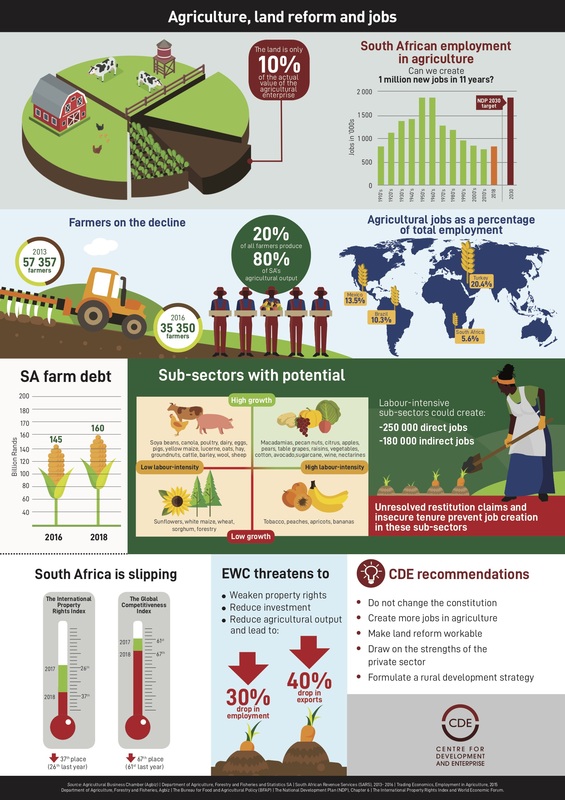 This article is based on CDE submission to parliament and a new publication: Agriculture, land reform and jobs – can SA make this work?